"Apple has a reputation for obsessive attention to detail in its hardware and software products, down to the beveled edges of the iPhone 5 and the shade of the icons on its screen. But it has stubbed its toe again and again when it comes to releasing reliable, well-designed Internet services. Its less proud moments include Ping, a social network for music that never took off; MobileMe, an error-plagued service for synchronizing data between devices; and, more recently, Siri, the voice-activated virtual assistant that is often hard of hearing." 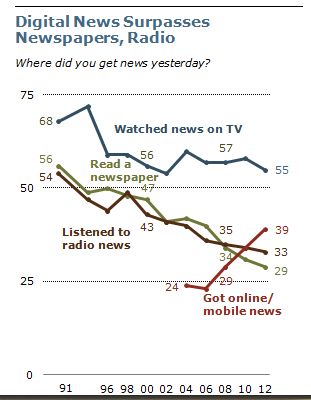 Anyone who watches the way those around them consume the news, or thinks about their own news consumption habits, is probably well aware of how large a role social networks like Twitter and Facebook now play in the way we get news, and also of how much that consumption is coming through mobile devices. A new report released Thursday by the Pew Center for the People & the Press confirms that both of those trends are large and growing — the study says that the influence of mobile in news consumption has almost doubled since 2010 and the impact of social networks has almost tripled in the same period. Those numbers are even higher for younger users. "Windows RT is a different animal entirely. Although Microsoft has been careful to keep the wraps on its ARM-based variant of Windows 8, I was able to spend a few days with a Qualcomm Liquid reference design tablet with dock, and I think it’s fair to say I know what’s going on here now. It’s simple: Windows RT is nothing less than a complete rethinking of what Windows can and will be in the future. It’s the future, in the same way that Windows NT was the future in the mid-1990s. Put another way, Windows RT is the devices-based version of Windows 8. (Or, Windows 8 is the PC-based version of Windows RT.) There are differences, few of which are subtle. Windows RT lacks some Windows 8 desktop features—Windows Media Player and Storage Spaces—and can’t run any non-bundled Windows desktop applications, such as Adobe Photoshop and Visual Studio. But in return, you get a clean new version of Windows that lacks legacy deadwood and the attendant security and reliability issues, has killer battery life, and ships on devices that are silent, thin, and light." "The watchdog addressed the open letter to ICANN’s board and CEO and other relevant parties. John M Simpson, privacy project director at Consumer Watchdog, said that there are plans by Google and Amazon to buy up enormous amounts of new TLDs. Simpson argues that it is one matter for a company to buy associated domains such as .Google, .YouTube, .Android, .Amazon, or .Kindle, but says that is not what they are looking to do. Simpson pointed out that Google is using a subsidiary, Charlestone Road Registry, to spend $18.7 million on domain names such as .eat, .buy, .book, .free, .web, and .family, while Amazon has applied for .free, .like, .game, and .shop. They are looking to buy 101 and 76 domain strings respectively." Unless BlackBerry 10 is an exceptional hit, which is far from certain, Mr. Wu said that RIM might be able to continue for only one or two more years. Some analysts had expected that the company would report that subscriber growth had stalled. At a developers’ conference earlier this week, Mr. Heins said that the number of BlackBerry users had instead grown to 80 million, up from 78 million." "The Field Trip app is a small step in that direction, and an example of what Google is capable of doing. Another is Google Glass, the Internet-connected eyeglass frames with a small screen. With Field Trip, Google is trying to move beyond the first generation of mobile apps, which were not much more than desktop transplants, Mr. Hanke said. Google wants to “move the device out of your way and put the information front and center,” he said, so people can “scan the environment and know what the Web knows about the places around you.”"
"Google Now also introduces a new trick. It combines the constant stream of data a smartphone collects on its owner with clues about the person's life that Google can sift from Web searches and e-mails to guess what he or she would ask it for next. This enables Google Now not only to meet a user's needs but also, in some cases, to preëmpt them. Virtual index cards appear offering information it thinks you need to know at a particular time." "I had exactly the same issue, iTunes was downloading tonnes of tunes from iTunes Match via the Verizon LTE network, even though I had set the settings to not download anything from iTunes over the mobile network. I spoke to a senior tech supervisor (Michael) who said he would elevate this to the engineers - he's going to call me back to let me know the outcome. I will post an update here once I've spoken to him again." "Allen P. Grunes, a shareholder at Washington D.C. law firm of Brownstein Hyatt Farber Schreck, who worked in the DOJ’s Antitrust Division from 1995 until 2007, said that the same antitrust triggers that attracted the DOJ’s attention four years ago would fire again. He also confirmed the Post’s report. “I meant that if it [Yahoo] tried to resurrect the agreement, it would be investigated again,” Grunes said in an email. “And since the market conditions haven't changed much if at all, the outcome would likely be the same. In other words, if Yahoo went over to Google, it would be an invitation for a lawsuit.”"
"There’s little to indicate what the hardware will be, or what it will do, but it is clear that B&N is just beginning to build the team. B&N is looking for a “Director, Engineering Windows 8“, and that’s the only 1 of the 2 listings which mention Windows 8 as well as the Nook. The other new job listing looks to be aimed at someone to manage the app developers for Windows 8. Put the 2 together and they suggest that B&N is going to have the new guys build the teams." "Amazon.com is going after the environmental crowd with a new site called Vine.com for buying green products. Vine is part of Quidsi, the company that Amazon bought in 2010 that also runs sites like Diapers.com (baby stuff), Wag.com (pets) and YoYo.com (toys). Vine will sell everything from cleaning supplies to baby accessories, beauty supplies and clothes — as long as they are green." "So when Bloomberg News reported yesterday that Intel CEO Paul Otellini had told Intel employees at a meeting in Taiwan that Microsoft’s Windows 8 is being released before it is ready, it quickly made waves and prompted questions about precisely what he meant. Today, Intel, which would normally ignore such a kerfuffle, took the unusual step of slapping back at what it called “unsubstantiated news reports” and reiterating an earlier comment that Otellini had made in public that, “Windows 8 is one of the best things that ever happened to Intel.”"
"Looks like Apple Inc. wasn’t quite prepared for the demand for the new iPhone 5, as the company sold out of its available units in just a few days. And it turns out Apple wasn’t quite ready in the software department, either. Its new iOS 6 operating system for iPhones and iPads has a couple of major new features that fall far short of Apple’s usually exquisite standards. Still, there’s plenty to like in iOS 6, especially for those with older iPhones who want a dose of the latest-and-greatest." "To hell with the weird remake of REO Speedwagon’s “Keep On Lovin You.” Here’s the song that captures the essence of RIM." "Several people who cover Yahoo have stated in very strong language that, although the search partnership with Microsoft has been a failure, there is no way that Yahoo could do an alternative deal with Google due to regulatory issues. I disagree with that view completely. A lot has changed since 2009. Yahoo!’s search share has dropped markedly. It also had to outsource all its back-end search technology (and talent, basically) to Microsoft. It simply isn’t the same situation now as it was then." "Intel Corp. (INTC) Chief Executive Officer Paul Otellini told employees in Taiwan that Microsoft Corp.’s Windows 8 operating system is being released before it’s fully ready, a person who attended the company event said. Improvements still need to be made to the software, Otellini told employees at a company meeting in Taipei yesterday, said the person, who asked not to be identified because the meeting was private." "Google is developing a maps application for iPhone and iPad that it is seeking to finish by the end of the year, according to people involved with the effort who declined to be named because of the nature of their work. There has been widespread speculation about whether and when Google would release a maps application for Apple devices since Apple released a new version of its iOS operating system with an Apple-made maps service." "The Nook HD is a seven-inch tablet, while the Nook HD+ is a larger, nine-inch device. Both are lightweight, have high-resolution displays and are running on “forked,” or modified, versions of Google Android’s 4.0 operating system. The tablets are available for pre-order today, and are expected to hit stores in early November. They’ll range in price from $199 to $299, depending on size and storage." This reads as ironic given Bigtable helped kickstart the NoSQL/eventual consistency/key-value revolution." ""We think it would have been better if they had kept ours. But what do I know?" Schmidt told a small group of reporters in Tokyo. "What were we going to do, force them not to change their mind? It's their call." Schmidt said Google and Apple were in constant communication "at all kinds of levels." But he said any decision on whether Google Maps would be accepted as an application in the Apple App Store would have to be made by Apple." "Shares of Google are up more than 30 percent in the past three months alone. The company’s current market cap is $244 billion. Google’s previous all-time high was $747.24, though it had never closed higher than $741.79. Both of those marks are from November 2007. Its next quarterly earnings report is due on Oct. 10." "As more tablets and touchscreens come to market, more solutions are emerging for consumers who like the feel and satisfying click of physical keyboards. I happen to be one of those consumers, which is why I had high hopes for Lenovo’s IdeaPad S2110. This $399, 10-inch tablet, which came to market last month, is built to work with an optional, attachable $100 keyboard. This keyboard goes beyond just keys: It also provides several extra hours of battery life and two USB ports, marrying the consumption-friendly features of a lightweight tablet with the productivity features of a laptop." "A phone's hardware performance can't be taken in isolation, but it's definitely a piece of the puzzle. Based on these benchmarks, the iPhone 5 lives up to the promise of being twice as fast as the iPhone 4S. It's also, for now, the fastest handheld computer sold in the US." "A yearlong examination by The New York Times has revealed that this foundation of the information industry is sharply at odds with its image of sleek efficiency and environmental friendliness. Most data centers, by design, consume vast amounts of energy in an incongruously wasteful manner, interviews and documents show. Online companies typically run their facilities at maximum capacity around the clock, whatever the demand. As a result, data centers can waste 90 percent or more of the electricity they pull off the grid, The Times found." "Larry Ellison has let the cat out of the bag about some announcements that Oracle is making at OpenWorld in San Francisco. The much-awaited Oracle 12c database is coming next week, as is an infrastructure cloud service for the Oracle Cloud, he announced on Thursday. Oracle 12c will sport features for secure multi-tenancy within a single database instance – something that Ellison has bashed as an idea in the past. It will be "cloud-enabled" - just as Oracle 9i was "Internet ready" and Oracle 10g and 11g were "grid-enabled,". In other words 12c could be clustered." "Separately, we’ve heard Google has been building separate versions of a iOS GoogleMaps.app for quite a while that goes back years. Additionally, we’ve learned an updated iOS 6 version of the Google Maps.app has been submitted to Apple. It is awaiting approval, however, and that could take some time. It took a year for Apple to approve Google Voice, for instance, and Apple could technically likewise claim Google Maps “duplicates a native service” even though there are quite a few mapping apps already in the App Store (like Google Earth). Last month, it looked as if Apple were putting an update to Google Voice that featured Siri-like functionality through purgatory." "For NFL teams, wiring stadiums is part of a larger strategy to keep fans from deciding that the benefits of watching a game at home outweigh those of attending in person. Besides enjoying climate-controlled rooms with large high-definition TVs, fans tuning in at home can keep their smartphones and tablets at the ready to: a) check scores of other games and their fantasy football stats and b) launch online flame wars with opposing fans. For teams like the Patriots, which have sold out every home game since 1994, fans will keep coming to games with or without Wi-Fi. Still, the team has been fielding complaints about poor cell reception for years. “I think fans have come to expect connectivity wherever they are,” says Fred Kirsch, vice president for content for the Patriots. “There have been calls over the years, people saying, ‘I can’t make a phone call, I can’t check my e-mail, I can’t upload a photo.’ ”"
"Wal-Mart did not specify why it was discontinuing its Kindle sales, but analysts said it was not hard to decipher, given that the retailer will still sell similar devices from companies like Apple, Google, Barnes & Noble and Samsung. Physical retailers have been worried about customers who browse in stores and then buy from online competitors instead. Displaying the new Kindles encourages that behavior, analysts said." "The problem is, that’s not a new rule for Twitter. In fact, according to the archive of Twitter’s developer rules of the road, this has been the case since at least April of 2011, if not longer (that’s as far back as the archive displays “recent changes”). So, essentially, IFTTT is pointing the finger at supposed changes in the Twitter ecosystem that really occurred more than a year ago. Granted, Twitter did little to enforce many of the guidelines for quite some time. Only in the past few months has Twitter shown more willingness to bring the hammer down on those it sees breaking the rules." "Oracle has been arguing that as it works on transitioning on the hardware business it absorbed when it acquired Sun Microsystems in 2010, sales will fall and profits will rise as it moves toward selling fewer products that command higher profit margins. As CEO Larry Ellison put in an interview at D: All Things Digital in May: “Sales are going down in hardware, but the unprofitable part is going away. Our margins are the highest of anyone in the server business. The sales are down 20 percent, but the profits are up.”"
"Amazon itself lets readers share their highlights and clippings through a feature called “Public Notes,” and it’s possible the company is cracking down on competing services like Findings in an effort to promote its own service. Considering that “Public Notes” is relatively under the radar, that seems somewhat unlikely. But the new Sony Reader lets users share passages through Evernote, and Amazon may be planning to make its own sharing features more robust. Finally, Amazon simply may not want third-party apps accessing Kindle highlights. If so, we should expect to see services like Evernote cutting off that functionality soon." "A week after the 11th-hour cancelation of an Acer smartphone powered by an operating system developed by Alibaba, another Chinese company has unveiled plans to create an alternative to Google’s (GOOG) Android. ZTE, the country’s biggest maker of mobile phones, today announced that in December it will begin selling a smartphone using an operating system co-developed with Mozilla, the company behind the Firefox browser." "OS X 10.8.2 is a major update to Mountain Lion, with some important new features — one in particular: Facebook integration. Also on board: Support for Passbook, Apple’s location-aware mobile wallet app, and some tweaks to iMessage and FaceTime that route messages and video chats to the Mac." "With Internet audio apps such as Pandora and Spotify, any smartphone can pull in ­music, news, and sports from around the world. But sometimes you want something close to home — your favorite hometown sports talk show, or local news and weather updates. Luckily, there are plenty of audio apps that tune into traditional radio­ broadcasts, offering features you won’t find on that bedside clock radio. Three of the best, Stitcher, iHeartRadio , and TuneIn Radio Pro, deliver an appealing mix of traditional radio and Internet podcasts. A fourth, DAR.fm, is a curious but clever service that serves as a kind of DVR for your favorite radio programs." "This is probably not what RIM (RIMM) executives wanted to read with their coffee this morning, but TechRepublic reports that both analysts and CIOs say that Apple’s (AAPL) iPhone has now matched RIM’s BlackBerry devices when it comes to enterprise security. As evidence, TechRepublic cites the latest research from Trend Micro showing the iPhone just behind BlackBerry in terms of total enterprise security protection. What’s more, Trend Micro security research director Rik Ferguson says that Apple has steadily added new security features to the iPhone over the past several years and is now ready to start “taking on BBOS and RIM on their home turf.”"
"Altova MissionKit is a software development suite of industrial-strength XML, SQL, and UML tools for information architects and application developers. MissionKit includes Altova XMLSpy, MapForce, StyleVision, and other market-leading products for building today’s real-world software solutions. Altova MissionKit is available in Enterprise and Professional Editions designed to offer the functionality you need – at an attractive price. Version 2013 of Altova MissionKit includes powerful new support for SQL stored procedures in data mapping projects, seamless integration of MissionKit functionality in Java applications, updated standards support, and more – as well as revolutionary new Smart Fix validation that can only be described as magical. You simply won’t find this functionality in other tools, much less in an integrated toolkit for cutting-edge application development and information architecture. This new functionality is detailed below along with the numerous other new features and updates that have been added to Altova MissionKit 2013." "The bottom line: The iPhone 5 completely rebuilds the iPhone on a framework of new features and design, addressing its major previous shortcomings. It's absolutely the best iPhone to date, and it easily secures its place in the top tier of the smartphone universe." "The good news for plenty of current iPhone, iPad and iPod touch users pondering buying the new iPhone 5 is that they’ll get many of the 200 new features in Apple’s free update for mobile software, iOS 6, available on Wednesday." "The world’s most popular smartphone becomes significantly faster, thinner and lighter this week, while gaining a larger, 4-inch screen—all without giving up battery life, comfort in the hand and high-quality construction." "You pick it up and it almost feels fake. That’s not to say it feels cheap; because it doesn’t — quite the opposite, actually. It just doesn’t seem real. Certainly not to someone who has been holding the iPhone 4/4S for the past two years. It feels like someone took one of those devices and hollowed it out." Users' documents will be stored on Microsoft's SkyDrive personal cloud storage offering by default but people can choose to store their documents, instead, on their local hard drive." "With Nik and other services, Google is trying to differentiate itself from Facebook and other photo-sharing sites with more advanced photo editing. Google, which owns Picasa and Picnik, the online photo editor, has incorporated their high-end tools into Google Plus, including adjusting light and pixel size, sharpening or softening colors and applying filters. Google seems most interested in Nik’s mobile and online tools and how they can improve Google Plus. Google declined to say whether or when it would discontinue any of Nik’s other products, like desktop software for professional photographers." "So if you don’t have to plug in to sync, backup, play music, or watch video, what do you really need to plug in for? Apple gave its new connector a jazzy name by calling it Lightning, but its purpose is far more ordinary than that. With almost all connections becoming wireless ones, Lightning is little more than a very well-designed power cord." "Baxter is the first of a new generation of smarter, more adaptive industrial robots. Conventional industrial robots are expensive to program, incapable of handling even small deviations in their environment, and so dangerous that they have to be physically separated from human workers by cages. So even as robotics have become commonplace in the automotive and pharmaceutical industries, they remain impractical in many other types of manufacturing. Baxter, however, can be programmed more easily than a Tivo and can deftly respond to a toppled-over part or shifted table. And it is so safe that Baxter's developer, Rethink Robotics, which loaned Baxter to Vanguard Plastics, believes it can work seamlessly alongside its human coworkers." "As anyone who uses a smartphone knows, the cost of performing data-heavy activities like streaming music or videos over a carrier's wireless network can add up, especially if you don't have a big data plan. And if you aren't careful, you can quickly go over your monthly allowance. A new free iPhone app called Snappli compresses data to reduce network usage and help users avoid costly surprises from watching too many episodes of Arrested Development on Netflix. It does this by directing Web traffic through the company's servers. And while it would seem that intercepting and compressing data could slow down your Web surfing, cocreator Eldar Tuvey claims Snappli can actually speed up your Internet access." Of course, if you want to discredit or satirize a politician based on a clip showing some reversal of a position, that will be made easier as well. Or, as Mr. Kahle put it, “Let a thousand Jon Stewarts bloom.”"
"HTML5 solves these problems. In theory. Mobile users react poorly to sluggish performance. Native apps have more direct access to optimized OS modules and hardware features…which means better performance, faster, more immediate interaction. That’s why games, always looking for speed, are almost universally native apps, and it’s why all smartphone vendors promote native apps, their app stores sport hundreds of thousands of titles. For the Lowest Common Denominator, consider a player piano that can read a scroll of eight parallel punched hole tracks, a maximum of eight simultaneous notes. You want to create richer music, perhaps on an organ that has multiple ranks, pedals, and stops? Sorry, we need your music to play everywhere, so we’ll need to enforce the eight note standard." "Anyway, you register your cellCONTROL at the Scosche website and then plug the device into the car’s OBD-II port; cellCONTROL uses a Bluetooth wireless radio signal to block your phone so you can’t place calls or send texts if it detects that the car is in motion. The device lets you block one phone, or if you pay $5 a month, you can block up to six, just by registering the number of each phone. So you can ensure that nobody in your family can use the phone while driving. Obviously, one of your kids could just unplug the ­cellCONTROL. But you’ll get an e-mail if that happens." "What all this means for finalized hardware for carriers is exactly what we’ve been expecting: a November release for many carriers, following the “big unveiling” of Windows Phone 8 possibly at BUILD ’12 in Redmond. Whether those dates are November 2nd or later remain to be seen, as carriers still need to approve the devices for general sale. " "The EarPods, Apple’s new headphones announced alongside the iPhone 5 on Wednesday, rectify nearly every complaint I’ve had with Apple’s white earbuds over the last decade. And while they won’t convert those spending hundreds of dollars on luxurious over-the-ear models, these new in-ear headphones do raise the bar for entry-level audio." "My best guess for October: an education theme. A smaller (and less expensive) iPad seems like an obvious fit for schools and as a holiday gift for kids. We know from last January’s iBooks event in New York that Apple considers education a high priority, and the iPad is at the center of it. Plus, it would nicely fit with new Macintosh hardware — say, a 13-inch MacBook Pro with Retina Display and a refreshed lineup of iMacs (but not yet retina, I’m almost certain — affordable 27-inch retina displays remain beyond even Apple’s ken today). Roll in some news from textbook publishers, education-focused app developers, and of course, some iPad games, and Apple would have a solid event." "Microsoft employees are just getting out of their big company meeting at KeyArena in Seattle, and if you hear any of them comparing Steve Ballmer to Oprah, there’s a reason: The company announced a surprise package of tech products and upgrades for employees — including new Surface tablets for everyone." "The iPhone 5 hiccuped onto the market today, taking down several online stores and quickly selling out the first supply of Apple's new smartphone. Initial stock from Apple for release day delivery sold out in less than an hour. Those looking to purchase the phone just after 1 a.m. PT discovered new orders from Apple's online site had estimated shipping times of "2 weeks" instead of the original "delivers by" September 21 message." He added, though, that “provisionally,” he thought Google made the right call. “Anything that helps calm the situation, I think is for the better.”"
"But already, a few things are clear. The speed and power, the tiny size and weight, the clarity and effectiveness of the audio and video, are beyond anything I could have imagined. The company is expending a lot of effort on design — hardware and software — which is absolutely the right approach for something as personal as a wearable gadget. And even in this early prototype, you already sense that Google is sweating over the clarity and simplicity of the experience — also a smart approach." "My next series of posts is entitled Social Books. Over five posts, I'm going to explore how book readers and writers use social networking tools. Three of the posts will be from the point of view of readers, starting with this one today about the leading social network for bookworms: Goodreads. In the remaining posts, I'll be checking out a brand new social network for writers and investigating how book publishers are using social media. So let's get started with far and away the most popular social network for book lovers in the world, Goodreads. Its user base has almost doubled in 2012, which made me wonder whether Goodreads has any real competition now..."
"Apple announced a slew of social updates to its products at the iPhone 5 event in San Francisco on Wednesday, incorporating Facebook sharing features into multiple parts of the Apple ecosystem. For one, Apple’s Siri digital assistant will be integrated with Facebook in iOS 6. That means that users can post status updates to their Facebook pages by merely speaking to their iPhone." "Apple sold 17 million iPads between April and June. That’s more iPads than any PC manufacturer sold of their entire PC line. And it sold 84 million iPads through June. The iPad had a 62 percent share of the tablet market a year ago. Today it has a 68 percent share. The iPad is responsible for 91 percent of the Web traffic from tablets." "Then again, Google sells its Nexus 7 for the same price as the Fire, without cluttering the screen with ads. The Nexus 7 gives you full access to the apps in the Google Play online store. The Kindle Fire offers only a smaller selection of Amazon-approved apps. The Kindle Fire doesn’t even come with an AC adapter for recharging. You can either plug it into your computer or buy an adapter for an extra $10. No doubt about it; the Kindle Fire HD is a major step up from its predecessor and a fine mini-tablet. But because of Amazon’s constant nickel-and-diming, you’d be better off spending your nickels and dimes on a Nexus 7." "Yet, more than half of all small businesses in the U.S. don’t have a website. Many of those businesses are completely invisible in the one place people are looking for them. The impact of being online is real: Businesses that make use of the web are expected to grow 40 percent faster and are nearly twice as likely to create jobs. Since small businesses make up half of the U.S. GDP and contribute two-thirds of all new jobs, the potential impact of getting these businesses (more than 15 million of them) online is enormous. We wanted to help spur a new wave of SMBs on the web, and change the perception that getting online is hard, expensive and time-consuming. This is just the beginning of our commitment to get businesses on the web and succeeding online. Today, small businesses throughout the U.S. can get online for free at www.AmericaGetOnline.com. Businesses get a free, easy-to-build website as well as a free, customized domain name and web hosting for one year. It’s fast, it’s easy and it’s free." "We wanted to simplify setup and capacity planning, and enable federation across multiple farms. We also wanted to accommodate requests for integration from new partners such as Lync. Finally, we heard from many customers, both on Office 365 and on-premises, that they wanted the same improvements that our SkyDrive users enjoyed on a regular basis. To achieve these goals, we went back to the beginning and rethought how the Office Web Apps would integrate with other products now and in the future. We created a new model that separated Office Web Apps from any specific partner technology. Ultimately our model placed a relatively light coding burden on file hosts such as SharePoint while allowing us to run Office Web Apps on entirely separate servers. This new standalone server product is Office Web Apps Server." "There are two devices in this review. The first is something like an appliance — a window through which you casually view content, a way to listen to music, an e-reader for the train ride home. On that device, things like a big app selection or elaborate user experience take a back seat to content selection, price point, and simplicity. On that device, it's not about going toe-to-toe with the competition in every way (as Amazon seems to want to do), it's about offering a lot of fun stuff to consumers, and getting them to consume more. As that device, the Fire HD is a complete success. A marvel of bottom-line engineering and incredibly clever subsidies. It's a really, really good tablet for doing some very specific things. " "Speaking with Michael Arrington at the TechCrunch Disrupt conference, Facebook CEO Mark Zuckerberg admitted that "we've had a bunch of missteps on [mobile]," specifically referring to its mobile app strategy. "The biggest mistake we made as a company was betting too much on HTML5 instead of native... We burnt two years." He said that the company would also drop HTML5 in its Android app as well, and that a native version would be coming "soon."" "One of the search engine’s biggest strengths is its simplicity — type anything into the search box and you’re off. But people could get a lot more out of Google, the company says, if they learned a few expert techniques, like searching by color, time or image. So Google is offering a free online course to teach search skills." "Well, let’s see now. The Fire HD has no camera on the back, no GPS navigation, no speech recognition, no to-do list or notes app. It trails the iPad in thickness, screen size, screen sharpness, Web speed, software polish and app availability. It can only dream of the iPad’s universe of accessories, cases and docks." "At TechCrunch Disrupt today, Salesforce CEO and founder Marc Benioff revealed the SaaS company’s next product—file storage. We don’t know much more, but the new product will be announced next week at Salesforce’s conference, Dreamforce." "Mr. Zuckerberg said he thought the company should be judged on its lasting impact, not just its stock price. “Ten, 20 years from now, the legacy of this company should be, we have connected everyone in the world,” he said. “That’s a lot.”"
"The Fire HD isn’t as polished, fluid or versatile as the iPad. It offers only a fraction of the third-party apps available on either the iPad or the Nexus 7 (and other standard Android tablets). I found that after prolonged use, the Fire HD showed signs of latency—apps and content displayed delays in launching. This latency disappeared after a reboot. The Fire HD also assaults users with ads occupying the entire screen every time they start or resume using it. You have to pay Amazon another $15, using an obscure setting on a Web page, to escape these ads. And there are pitches to buy more content on many other screens, even those displaying your already-purchased content." Overall, 55.5% of mobile phone subscribers in the U.S. own smartphones, up from 41%"
"Google has released an all-new YouTube app for the iPhone and iPod touch, which it said it was working on last month when Apple revealed it was removing it from iOS 6. The new app is completely native, and in our brief time with it we found it to be fast and responsive. It uses the same design language as the Google+ app on iOS, and like that app it's quite good at loading up reams of new content quickly." "The iPhone 5, which Apple Inc. plans to release this week, could get credit for something Congress, the White House and Federal Reserve have struggled to do: boost the U.S. economy in a measurable way. Sales of the new iPhone could add between a quarter and half a percentage point to annualized economic growth in the fourth quarterJ.P. Morgan JPM -1.37%’s chief U.S. economist Michael Feroli estimates. That could help to cushion the U.S. economy from other risks in the final months of the year." "Last quarter, Android's smartphone share surged to 68 percent, up from 47 percent a year before, while Apple slid to 17 percent, down from 19 percent a year before, according to IDC. Worse yet, in the June quarter, Apple's smartphone unit sales grew 27.5 percent, while the overall market grew 42.2 percent and Android grew 106.5 percent. That's right. Apple, the "market leader," is growing slower than the market, and has one-fourth the market share of its biggest rival. So how do you lose ground in a market but still turn in barnburner financial results?" "Visio 2003, 2007 and 2010 all had the same primary Visio Drawing (VSD) file format. For most users, this was great: files could be shared easily between these three versions of Visio. There were, however, some drawbacks. Most notably, the primary format was binary, which limited both the information stored in the file and how easily IT professionals and developers could work with it. For example, it was difficult for third parties to access and extract data from the binary format for use outside of Visio. For the new Visio, we introduced an XML-based file format to provide new capabilities in Visio and improve interoperability with other applications." "Put it all together and you get remarkable story about a device that, under the normal rules of business, should not have been invented. Given the popularity of the iPod and its centrality to Apple’s bottom line, Apple should have been the last company on the planet to try to build something whose explicit purpose was to kill music players. Yet Apple’s inner circle knew that one day, a phone maker would solve the interface problem, creating a universal device that could make calls, play music and videos, and do everything else, too—a device that would eat the iPod’s lunch. Apple’s only chance at staving off that future was to invent the iPod killer itself. More than this simple business calculation, though, Apple’s brass saw the phone as an opportunity for real innovation. “We wanted to build a phone for ourselves,” Scott Forstall, who heads the team that built the phone’s operating system, said at the trial. “We wanted to build a phone that we loved.”"
"Google is a search engine, not a store, but it is increasingly inching into e-commerce with products like its comparison-shopping service, Google Shopping. At the same time, more people are using Amazon, a retailer, as a search engine to look for what they want to buy. Trying to stave off the competition from Amazon, Google has recently changed Google Shopping to require e-commerce companies to pay to be included in shopping results, so product listings are now ads. Inclusion used to be free." "The plan buys 250 megabytes of data a month. But if you want to view 30 or more Web pages, or stream more than four minutes of video, or listen to more than 20 minutes of streaming music per day, that isn’t going to be enough. Watching a single two-hour HD movie would use up 614 megabytes, according to AT&T’s data calculator. A 1.5 hour HD movie would use up 461 megabytes. What happens if you go over? AT&T turns off the service until the next month – which means a long intermission." "Worldwide sales of e-paper screens from E Ink and its rivals fell from 5 million in the second quarter of 2011 to 1.2 million in the same period this year, according­ to DisplaySearch. And E Ink’s Taiwanese parent company, E Ink Holdings Inc., reported a $26 million loss in the first quarter of 2012, compared with a $43 million profit in the previous quarter. However, the market for those screens is now dominated by E Ink, Semenza said. Last month, the company agreed to buy SiPix Technology Inc., its main competitor, leaving E Ink as “the last man standing” in a diminished but still profitable e-paper market." "A day after confirming that all its new Kindle Fire tablets would feature unavoidable “Special Offer” advertisements on their lock screens, Amazon has reversed course and said there will be a way to avoid them after all. For a one-time payment of $15, Kindle owners can opt out of the ads for the lifetime of the device." “Roth's complaint was detailed by Roth himself today in "An open letter to Wikipedia" published by The New Yorker (a sister publication of Ars). Roth tried to fix the error that his novel was "allegedly inspired by the life of the writer Anatole Broyard.” In reality, Roth explains, the book's story was inspired by an event in the life of Roth's friend, Princeton professor Melvin Tumin. Tumin was trying to track down a couple of students who had never attended class, and asked if they were "spooks." The two students were black, leading to accusations of racism against Tumin. When Roth tried to give Wikipedia the true origins of the novel, he says he was told by a Wikipedia administrator on Aug. 26 "that I, Roth, was not a credible source." "Previously, Google powered web searches on the Kindle Fire. We've reached out to Microsoft and it told us, "Bing will be the default search provider on the new Kindle Fire HD. No other details are available at this time."" "That’s a change that’s likely to make some waves, considering that Google used to be the default search engine for the Kindle Fire. Ubergizmo said that they didn’t know if users could change the default search engine, but in the time since their hands-on went live, Ars Technica has confirmed with Amazon that changing the default is possible. Bing comes as the default for Silk, Amazon says, but users will have the option of switching to Google or Yahoo if they wish." "Later this year, a Boston-based company called MC10 will offer the first of several “stretchable electronics” products that can be put on things like shirts and shoes, worn as temporary tattoos or installed in the body. These will be capable of measuring not just heart rate, the company says, but brain activity, body temperature and hydration levels. Another company, called Proteus, will begin a pilot program in Britain for a “Digital Health Feedback System” that combines both wearable technologies and microchips the size of a sand grain that ride a pill right through you. Powered by your stomach fluids, it emits a signal picked up by an external sensor, capturing vital data. Another firm, Sano Intelligence, is looking at micro needle sensors on skin patches as a way of deriving continuous information about the bloodstream." "Shares of Pandora plummeted more than 19 percent in early morning trading Friday, falling to $10.15. And that precipitous decline more than erased the 15 percent gain the company’s stock had managed to win over the past three months. Clearly, investors are terrified at Pandora’s prospects in the face of a formidable competitor like Apple — a company whose mobile devices are responsible for a lot of Pandora usage." "After spiking to a 52-week high of $712.25 Friday, Google’s stock ended the day at $706.15, a price it hasn’t hit since 2007. That’s still a ways off from the record high of $747.24 it hit in November 2007, but it’s clearly headed into the same territory. Google’s shares have gained about 19 percent since the company last reported earnings, when it turned in solid financials thanks to its thriving core advertising business." "Google has been dropping lots of hints lately about their desire to become not just a leader in advertising, but a leader in ecommerce as well. A recent Forrester report claims that 30% of all online shoppers start their product research at Amazon.com is just fuel to the fire. Google is trying to combat that growing percentage with more sustainable consumer-focused ecommerce initiatives, centered around local availability, the Google Wallet, Google Shopping, and Google Trusted Stores. The following is an analysis of Google’s recent ecommerce developments." "The "Bing It On" challenge lets users compare Google and Bing search results side by side. On the BingItOn.com website, you can type in five search queries, with the results from each search engine displayed -- unidentified by which search engine -- in two columns. For each query, you choose a winner (or a draw). At the end of the five queries, you'll find out which search engine you preferred." "GizChina reports that a Chinese manufacturer has used leaked photos of Apple’s next-generation iPhone to slap together a quick knockoff of the device called the Goophone I5 and release it before Apple has a chance to launch the genuine article later this month. What’s more, the company has actually patented the knockoff design in China and is poised to sue Apple if it launches the next-generation iPhone in China later this year." "This is definitely a close race. The answer may have less to do with which model has the "best specs," and more with which one offers the better app ecosystem. In other words, if you're already invested in the Amazon mediascape -- with ebooks, music, and Prime video -- the Fire HD will likely have the edge. (The Kindle ebook and Amazon music apps are available on the Nexus 7, but Amazon video is not; nor is the Amazon Lending Library.) And if Google Play has some must-have apps you can't get on Amazon, that might be the tipping point." "Apple's service would work on its sprawling hardware family, including the iPhone, iPads and Mac computers, and possibly on PCs running Microsoft Corp.'s Windows operating system, according to one of these people. It would not work on smartphones and tablets running Google Inc.'s Android operating system, this person added, highlighting the mounting battle for mobile dominance between the two technology giants." "Is the price of the Kindle Fire HD with LTE ($499) subsidizing the data plan? Bezos: I’m not going to break out the economics of any particular piece with you, but you’re right, it’s an astonishing price point. How does special offers, or the advertising, play a role in the price point? We had it on our E-Ink devices, but haven’t had it on the Kindle Fire. For those, it’s very good, no one really buys the non-special-offers version. Everyone buys the special-offers version. There aren’t two versions of this (pointing to the new 7-inch Kindle Fire HD). That was a decision we made because no one is willing to buy the non-special-offers version." "Kay also said the new Fire tablets and the Kindle Paperwhite mean big trouble for bookseller Barnes & Noble Inc., which has had some success with its Nook line of e-books and tablets. “There’s not much room in the market for also-ran competitors,” Kay said. Between the iPad­ and the Kindle, he predicted that Barnes & Noble will fall far behind its two giant rivals." "After making an informal debut in a televised ad late last night, Amazon's larger Kindle Fire has finally been unveiled. Introduced today at a press event in Los Angeles, the new Kindle Fire HD features an 8.9-inch 1920x1200, 254ppi display. It includes an HD front-facing camera and a laminated touch sensor for better visuals and 25-percent less glare. Under the hood, Amazon has dropped in a Texas Instruments OMAP 4470 processor, which it says outperforms the Tegra 3. The Kindle Fire HD also includes stereo speakers, an upgrade over the Kindle Fire's mono driver. While the company is also offering a 4G LTE variation, Amazon has also improved Wi-Fi networking by adding a dual-band 2.4GHz/5GHz receiver, two antennas, and its new MIMO radio technology. It'll ship with 16GB of local storage, with additional storage available in the cloud." "For nearly everyone, it’s time to dump Java. Once promising, it has outlived its usefulness in the browser, and has become a nightmare that delights cyber-criminals at the expense of computer users. "But Nokia has violated the First Law of the Carny: you take the customer’s money right after you’ve gotten them excited about what you’ve just shown them. You don’t let everybody go home with their wallets still secure in their pockets, and just hope that they all remember to come back to your tent two or three months later." "Google’s Android is continuing its impressive run in the Chinese smartphone market, soaring to 83 percent market share in the second quarter of 2012, according to a new report from Analysys. Nokia’s Symbian and Apple’s iOS have each been left with 6 percent share." "Kicking off the Motorola event in NYC, Google's Eric Schmidt has revealed some new Android figures for its captive audience of journalists and bloggers. It's now notching up some 1.3 million activations a day, which includes around 70,000 tablets ("We were late to them", notes Schmidt) every 24 hours. In total, that makes for just shy of 500 million Google-powered mobile devices around the globe -- 80 million in just over two months." "The rise of Apple and Google in the smartphone market has pushed Nokia and Research In Motion to the brink of irrelevance. Now, television makers are scrambling to make sure the same does not happen to them. At the IFA consumer electronics fair in Berlin, Toshiba, LG Electronics and Philips Electronics said they were banding together to develop a common system that would let people listen to music, watch videos and play games via the Internet on television sets." "We're expecting quite a few things out of tomorrow's Amazon event, and the company just helped heighten expectations a little bit more with a new commercial. The brief spot aired during tonight's Giants and Cowboys game, and it clearly features a backlit E Ink Kindle reader — matching the "Paperwhite" leaks we've seen — and ends on a shot of a woman watching video on what appears to be a large-screen tablet. That would match up with the Kindle Fire leaks we've seen, which seem to indicate two updated tablets in both 7- and 10-inch sizes." "In other words, it’s launching with a disadvantage. Certainly, that’s the view of the market. Nokia shares fell more than 11 percent, to $2.51, following this morning’s event, as investors came to grips with the idea that the Lumia will ship after the new iPhone. “In terms of timing and pricing, Nokia only indicated that the phones are expected in select markets later this year,” Wells Fargo analyst Jennifer Fritzsche said following the event. “Given the lack of carrier partner announcements, indefinite timing, and no unexpected product announcements, we view today’s event as a disappointment.”"
"Why buy a new PC now, with Microsoft Corp. rolling out its new Windows 8 operating system on October 26? Why buy a new smartphone when Apple Inc. is about to introduce a new iPhone and Microsoft will soon pop the cork on Windows Phone 8? And as for tablet computers, that iPad may look good, but Amazon.com Inc. is upgrading its Kindle Fire, and Microsoft will soon release its radical new Surface tablet. So do you buy or wait? It depends. If you’re looking for a new PC, I say grab it now. But when it comes to phones and tablets, I’m inclined to hold off for a while longer." "But it might be even more interesting if Amazon were to use the ad-supported model on a larger Kindle Fire, offering a true alternative to the iPad at a considerably lower price, at least for people willing to put up with a few advertisements. I have one of the ad-supported Kindles, and in my view, at least, the advertisements don’t do anything to diminish the experience of using the device. At the risk of warming Jeff Bezos’ heart, at times the ads have actually alerted me to deals or products that I was happy to learn about." "If you’re looking to buy a Windows RT tablet, security vendors said, don’t expect to be able to protect it with third- party antivirus or other security software. In fact, it seems that Microsoft may block third-party antivirus vendors from developing security solutions for Windows RT. Microsoft won’t allow such software to be sold on its online store, which is the only way to load applications onto Windows RT devices, security vendors say. It’s not known whether Microsoft will develop its own security solution for Windows RT, although most security observers assume Microsoft will do so." Is Microsoft Blocking Antivirus Apps from Windows RT? "Intel says the fourth generation of its widely used Core line, code-named Haswell, will have greater performance, more sophisticated graphics and stronger security capabilities. But the biggest change is in power consumption, with the new chips drawing 10 watts versus 17 watts for comparable existing chips. "Basically it means we can make devices even thinner, even lighter and with an even higher battery life while still giving a full PC experience," said Kirk Skaugen, general manager of Intel's PC client group, in an interview. "Once and for all, you will feel comfortable walking out of your house and not carrying your power brick."" "But growth is growth, and given the overall decline in the business PC market, the Mac is clearly gaining traction there. There are a few obvious reasons for this. First, Apple’s OS X operating system has become increasingly more business-friendly over the years, and now plays well with Windows applications, thanks to software like Boot Camp, Parallels and VMware’s Fusion. Second, the so-called “consumerization of IT,” which sees the rank and file acclimatizing enterprise to consumer devices like the iPad and iPhone, and opening the door for bigger hardware like the Mac." "Think of it as the opening act at a concert: Nokia, Motorola and Amazon are expected to unveil new mobile devices this week before attention turns to a new iPhone and possibly a smaller iPad from Apple." “Dual Screens – What’s the Point? "Users of BBC catch-up service iPlayer can now download programmes to watch on phones, tablets and other mobile devices at a later date. They can save any programme for up to 30 days - but once they hit play, have to finish watching it within a week." "While voting for the president via a browser may never happen, it’s now easier to register to vote online, thanks to the Obama campaign and the Democratic party, which debuted two flavors of online voter registration widgets just days before their nomination convention. Late Friday night, the Democratic National Committee released open source software that allows any site — whether it leans Republican, Democratic, Libertarian or Occupyist — to embed an unbranded app that helps citizens register to vote. " "Your smartphone is going to get more adept at handling money, but maybe not in quite the way you've been imagining it would. There's been a lot of talk lately about mobile payments and how new apps or NFC technology will let you pay for things with your smartphone. But the truth is that this market is less about finding a new way for you to pay for things and more about offering you an easier way to carry and redeem coupons and special offers." "For this week’s review, I tested Amazon’s Cloud Player, a Web and mobile app that automatically recognizes the music files you’ve already purchased, adds those same tracks to your Amazon cloud account, and then lets you stream those files on up to 10 devices, even if you got the music from iTunes, from a CD, or some other source. Amazon is able to do this in part because it recently obtained the music rights from the four major record labels in the U.S. The service is now more comparable to iTunes Match, Apple’s cloud-based service, which similarly scans and matches non-iTunes music files on up to 10 devices." "Francisco Jeronimo, an analyst at International Data Corp. in London, said there were signs that Lumia devices were beginning to gain market share on Apple and the makers of Android phones, especially Samsung of South Korea, the industry leader. In Finland, Windows’ share of the domestic operating system market rose to 32 percent in June, nearly overtaking Android, with 36 percent. One year earlier, Windows had zero market share, according to I.D.C. While some might attribute the gain to Nokia’s hometown advantage in Finland, Mr. Jeronimo said Finnish buyers had largely rejected the Symbian smartphones from Nokia." "Free Wi-Fi service is becoming an important tool for operators in maintaining quality mobile service during a time of skyrocketing data traffic, congested mobile networks and, for travelers, costly roaming charges. Public Wi-Fi networks have sprung up in many big cities. According to Informa, a research firm, the number of Wi-Fi hot spots worldwide will reach 5.8 million by the end of 2015, up from 800,000 in 2010. Eight of the world’s 10 biggest mobile operators are using Wi-Fi to offload their cellular data traffic." "“Strategically, what they have done should be a model of how to create and support a virtual start-up within a larger corporation,” said Anil Dash, a writer and entrepreneur in digital realms. “Condé gave it enough rope and left the people there to their own devices. I don’t know whether it was a brilliant strategy or accidental neglect, but the founders did not leave, the community stayed intact, and the site grew beyond anybody’s expectations.”"